So what about anime… inside anime? 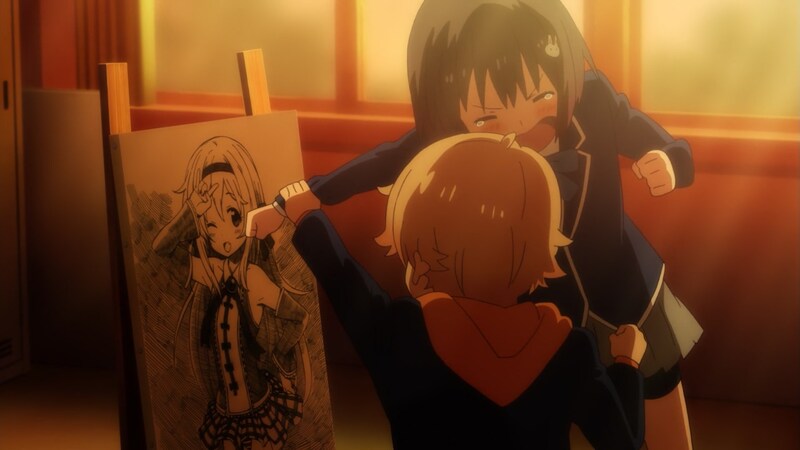 Art in general existing within anime can be a bit of an issue. We have a living example right now in KonoBi, a show that explicitly makes a point about one of the main characters being weird because he draws moe girls for an art club. 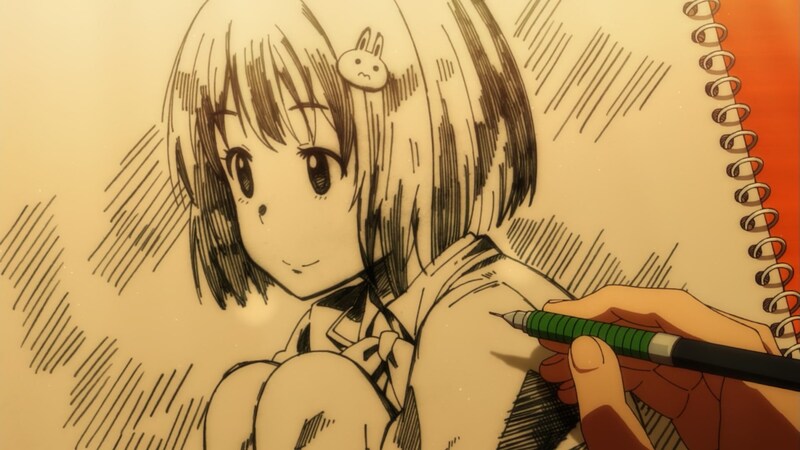 Looking at his work though, you realize that these teens he draws aren’t all that different from the show’s cute cast; his usual drawings only really stand out from the supposedly realistic ones because of details like unnatural hair color and ridiculous outfits and poses, not really due to a different style. This is an issue it directly inherited from the manga and honestly a minor nitpick on a nicely put together production, but it does highlight the potential downfalls of portraying art within art. Let’s look at the bright side now instead, when animation within animation goes right. If these scenes are significant enough they tend to be credited separately – under a title along the lines of 劇中劇原画 / In-show Key Animation – to either a guest artist or someone that already belonged to the production and was tasked with it. That was the case of Takaaki Wada on Sweetness and Lightning a few weeks ago; Wada has been a very regular key animator for the series, drawing lively but by all means understated character cuts. But he eventually got the chance to do something really different, when an episode showcased footage of the magical girl series that Tsumugi is a big fan of. Distinct designs, a neat transformation sequence for a character reminiscent of Heartcatch Precure’s Yuri, and even different animation timing, wilder than you see in the actual show. These parodies can easily come off as uninspired, since at their worst you feel they wouldn’t work as the real product they’re mimicking – often the case with these mahou shoujo gags, which tend to feature transformations that aren’t impressive enough to compare to the real thing. People like Wada are clearly good enough to animate something that would stand on its own, though; it was only a few months ago that he also animated a fake in-show samurai series for Ace Attorney, which was notoriously better than the weak production it’s attached to. Capturing a particular feeling can be even more important than nailing the aesthetics, of course. Just this week, New Game managed to bring a smile to many people’s faces by perfectly recreating an RPG opening. The character designs are blatantly modern, but the music, the structure of the sequence, and that adventurous vibe belong to an instantly recognizable pattern. Even details like the fake company logos at the beginning make it feel more authentic, which at the end of the day is more important than being realistic. It’s easy to believe that if a new RPG with classic roots got made within the New Game universe, it would look exactly like the snippets of Fairies Stories that the series has shown us. It’s worth noting that this sequence had a very impressive animator lineup – people like Yasushi Nishiya, but especially very young talent like Aninabe, Takahito Sakazume and ちな – so they obviously wanted something worthy of being a real opening, despite its use being nothing but a one-time gag. You have to admire that dedication! Sometimes the staff will go as far as to seek appropriate artists to handle works that are being directly referenced; it ensures they will pay proper homage to the original and not come off as a cursory wink, plus it gives them an extra layer of meta amusement. Last year, Shirobako made an art of the latter; while the show is otherwise a mediocre production – sad to say as a huge fan, but it’s unfortunate for an anime about making anime – they regularly nailed these moments. When one character acting cut within the series needed a retake to convey more nuance, they relied on one of Musani’s best artists… and Yuriko Ishii in real life, the one great character animator P.A. Works have at their disposal. Similarly, the climax within the first show we saw Musani produce was a scene complex enough they had to let a legendary animator handle it – and the living legend Toshiyuki Inoue was tasked with animating the result. The 2D effects animation that gave them trouble was animated by Gundam Unicorn’s effects master Nobuhiko Genma, and even the beautiful backgrounds they had to beg to a quirky artist for were drawn by the real person who was being parodied. Anime focusing on its own industry seems to be the perfect chance to play around with this idea, since its sadly ignored cousin series Sore ga Seiyuu also did it often; cases like the recurring animation character designer for Tales Of Tokuyuki Matsutake animating its blatant parody, perfectly fitting in a show where many voice actors and actresses appeared as themselves. This is of course a broad topic, since we are talking about a relatively common practice and the approach each production takes to animation within animation is different. There are countless amusing anecdotes waiting to be uncovered, but this was a nice chance to bring it up in regards to a couple of current series. I wouldn’t mind revisiting it if interesting new examples pop up, or even focus on it for a longer piece looking at this kind of situation throughout the years. I hope you enjoyed it! And that’s it for this week, since I wanted to have another thematic installment of the Weekly Highlights – alternating these with the more scattershot ‘here’s a bunch of things that happened recently/are relevant now’ kinds of posts seems to make as many people happy as possible. 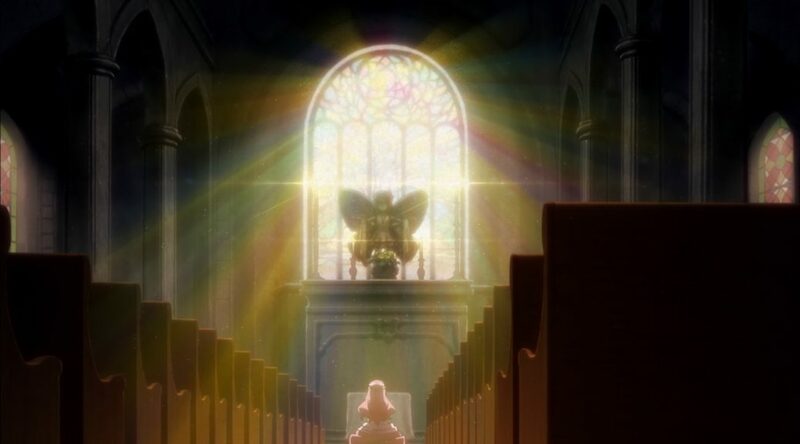 Mob Psycho had yet another spectacular episode, perhaps with less poignant direction than its absolute best but with lots of pieces of animation worth looking into. Don’t worry though, the show is going nowhere! I can still come back and discuss the series, since apparently neither the writers here nor our dedicated readers can get enough of that. i herd u like anime so we put some anime in ur anime so you can anime while u anime, ROFL! Would it be wrong to post the anti-Sakuga in response to these examples? I still think that’s one of the most effectives usages of non-standard animation for that, even if people love to mock it! I’m glad it’s on the booru even.